C. S. Boyles, Jr.. Will C. Brown’s real name, has become a favorite writer of mine. I’ve posted on him before. That post solicited a comment from his granddaughter explaining his name. it’s C. S. Boyles, Jr., but when he joined the army, they didn’t like initials. So he made it Clarence Scott for their purposes. 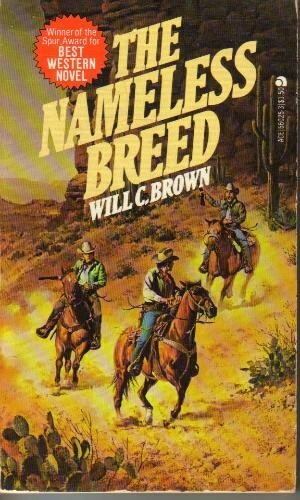 THE NAMELESS BREED won the Spur Award for best western novel in 1960. Brazos McCloud watched in helpless fury as the Mexican army dragged his father off in chains. They had raided his samll town in the Republic of Texas and Seale McCloud had gone out to talk to them. That had been three years ago. Word had come that the Mexicans had given his father, along with a number of white captives, to the Comanche Indians. It was common practice to buy captives back, but the McCloud family had no money. Brazos’s brother were minding the home while he had taken a job by two men working for the English. Captain Spide, nicknamed The Spider, had offered him a thousand in gold to steal a pouch of Union papers concerning the future of the republic from a courier who was transporting them North. Brazos had done so and, while fleeing, had taken a Cherokee arrow in the shoulder from a roving buck. His next conscious memory was at a doctor’s home in San Antonio being attended by his daughter. He slips out to visit The Spider and confirm the deal. While gone, agents for the Lone Star government had visited the Doctor’s home looking for him and in the ruckus, a fire was set. Now everyone is after him. Agents from England, Mexico, the Union, and even the Rangers were hunting him. He has to get the papers while avoiding a second double cross and, with his brothers, make the long trek north to find and buy his father’s freedom. For more forgotten books, as always, check out Patti Abbott at her blog, Pattinase on Fridays.